shelter and dwelling have always been an integral part of what it means to be human, a place to be safe and a place to be warm and dry. it is this desire to protect ourselves and our well-being that has guided our development from humble hunter-gatherers to nomadic herders to settled farmers. our dwellings have always followed suit; caves gave way to tents that allowed us to move with our herds and food sources. tents and movable structures gave way to buildings with foundations, immovable dwellings that allowed us to reside in one place for an entire generation or more. however, after hundreds, if not thousands of years, of static lifestyles and farming communities, something has happened. something has changed. we are no longer a community of static individuals; with global communities and worldwide infrastructure we live in an era of impermanence, one of transition. no longer are we grounded in one place for an entire lifetime. rather, we move constantly, job to job, house to house, country to country in a constant ebb and flow undulating across the world as if to display that after a millennia, yes we are living breathing creatures, rational creatures who move and change their mind, creatures who develop new and ingenious technologies and alter both the landscape and the environment around us. one question is omnipresent: is it still appropriate that we continue to build such static, permanent dwellings? in the not so distant summer of 2016 the city of chicago aims to host the olympic games. 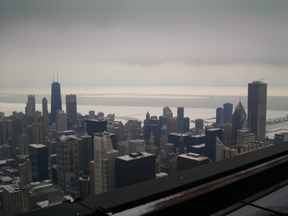 the city of chicago has a rich history of worldwide cultural gatherings beginning with the “white city” of the 1893 columbian exposition, and as the city competes worldwide for the 2016 games it becomes increasingly clear that a number of infrastructural upgrades as well as new sporting, business, and housing facilities must be built in order to host another such globally significant event. while chicago is seemingly prepared in the area of sporting venues it is certainly under-prepared in the area of olympic housing. there are innumerable architectural situations in which impermanence and flexibility are merited, if not required. of all of these there is one that speaks to the very global phenomenon that spawned a shift back to flexibility, one architectural typology that chicago finds itself face to face with: the olympic village, more specifically, olympic housing. this thesis, in the pages to follow, will propose a flexible olympic village for the 2016 chicago summer olympic games that will be intended to house the world’s 17,000 athletes and coaches and create a thoughtful, more contemporarily significant, flexible dwelling. hi…im sonu, my seminar topic is metabolisam in architecture. its mean flexibility and changeability of building. if u can suggest me anything related to it will b most wellcome….